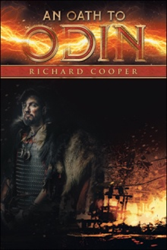 Richard Cooper marks his publishing debut with the release of “An Oath to Odin” (published by iUniverse), a novel that was produced while he used writing as a therapy for him during the time that he provided counseling for the people who were affected by the 9/11 terrorist attacks in America. Set in Norway, the countries of the North Atlantic, England and Scotland, the book is a coming-of-age story about a young Viking named Thor. Waking in the morning with a splitting headache, Thor finds his whole way of life decimated. He makes an oath to Odin that he will rebuild his father’s village and conquer the marauders who destroyed his village. Setting out, the young Viking must become a man if he hopes to fulfill his oath and rise to prominence. As the voyage begins, Thor struggles with his own immaturity and desperate need to succeed. Readers are invited to witness if “An Oath to Odin” will drive Thor to get his revenge and forge a great kingdom built on the strength of his wrath. Richard Cooper has a Bachelor’s Degree in Sociology and a Master’s Degree in Science Education. Currently, he teaches adult education for the Tennessee Department of Correction. He is retired from the U.S. Navy and lives in Tennessee with his wife and daughters. He is currently interested in glass blowing and knife making. iUniverse, an Author Solutions, LLC, self-publishing imprint, is the leading book marketing, editorial services, and supported self-publishing provider. iUniverse has a strategic alliance with Indigo Books & Music, Inc. in Canada, and titles accepted into the iUniverse Rising Star program are featured in a special collection on BarnesandNoble.com. iUniverse recognizes excellence in book publishing through the Star, Reader’s Choice, Rising Star and Editor’s Choice designations—self-publishing’s only such awards program. Headquartered in Bloomington, Indiana, iUniverse also operates offices in Indianapolis. For more information or to publish a book, please visit iuniverse.com or call 1-800-AUTHORS. For the latest, follow @iuniversebooks on Twitter.